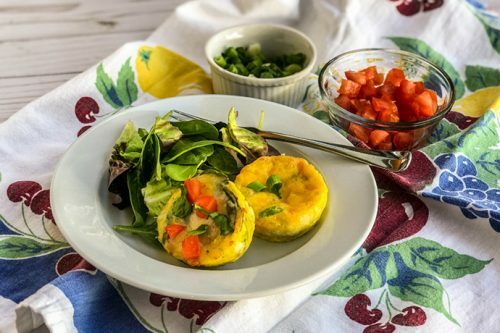 Breakfast is served with these easy and oh-so-delicious Mini Frittatas made 3 ways, with simple ingredients, savory flavors, and healthy vegetables. Simple to make in muffin tins, these frittatas will satisfy every eater in your crowd. Preheat oven to 350°F and lightly spray a 12-cup muffin tin with nonstick cooking spray. In a large bowl, whisk together the eggs and green onion. Season with salt and pepper, to taste. Add the egg mixture to each muffin tin, about halfway up. Divide the three frittata topping combinations into each of 4 muffin cups. Bake in a preheated oven for 20 minutes or until the frittatas are set in the middle. Allow to cool in the pan about 5 minutes. With a plastic knife, release the frittatas from the sides of the muffin tin. Refrigerate in an airtight container for up to four days. To freeze, wrap each mini frittata in plastic wrap and place into a freezer zip-top bag for up to 2 months. Nutritional Note: The nutritional information is based on the frittata base of egg, green onion, and cheddar cheese.